Mohlabetsi Safari Lodge offers the perfect African Wildlife experience. A welcoming accommodation oasis in the bush, set amongst shady trees with sweeping view over the bush and the Drakensberg Mountains beyond. A well-frequented waterhole is in the foreground and a host of birds provide soothing background sounds. The camp is unfenced, making it a real part of its environment, and animals wander through when the camp is still. 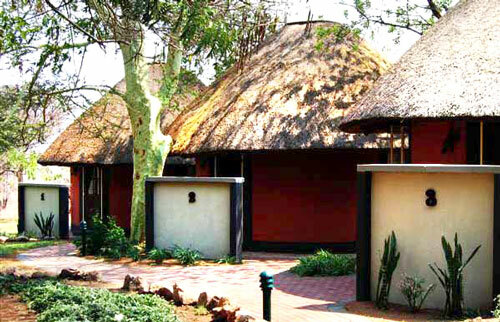 Six ethnic rondawels, under thatch, are comfortably furnished in an African style and have en suite bathroom facilities. 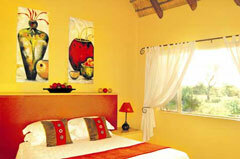 They are well insect-proofed and have overhead fans to keep the rooms cool and comfortable. 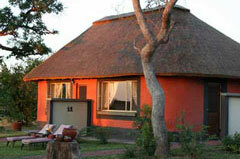 The central living area has a lapa under thatch with wonderful views and drinks close at hand. The pool, set amongst shady trees, is a haven on hot summer days. The camp is small and intimate and your hosts, staff and Pippa the dog, will ensure a stay that will provide a lifetime of memories. Meals are a highlight, with dinners being served in a reeded boma, around a crackling log fire. Campfire cuisine caters for every taste and the sounds of lion, hyaena and jackal provide a wonderful backdrop to a unique dining experience. Game drives are conducted in open 4x4 wildlife safari vehicles and our guides have an incredible knowledge of the fauna in the region. 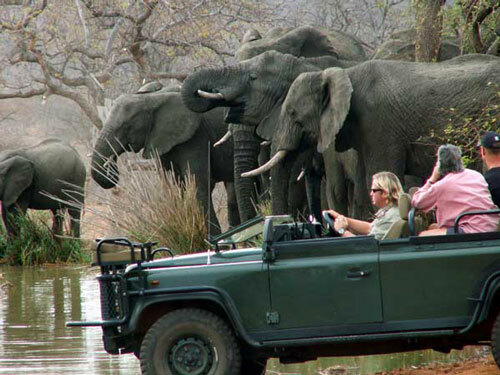 Also on offer are optional tours to the Kruger Park in comfortable VW Microbuses. Set off before dawn, we enter via Orpen or Phalaborwa Gates at first light. The early hours are spent in search of the elusive big cats and other general game, before enjoying a hearty breakfast at one of the many picnic spots. Thereafter, we traverse large sections of this wonderful reserve, before taking lunch. The afternoon is spent making our way back to the Lodge, after a rewarding day filled with happy memories & wonderful pictures. Another option is a Panorama Tour, into the scenic Drakensberg Mountains. We visit the magnificent Blyde River Canyon, Bourke's Luck Potholes, God's Window, as well as the many spectacular waterfalls. Lunch is enjoyed at Pilgrim's Rest, an historical gold rush village, before we descend the scenic Abel Erasmus Pass and return to the Lowveld. With informed and registered guides,these excursions give you the best that the area has to offer.